Medjugorje: The Message” by Wayne Weible. He chronicles his journey there and is one of the first books about Medjugorje. Fr. Matt’s dad decided that the whole family should go together and he announced that the summer when Fr. Matt was 17 that the family vacation would be this trip. His father told him that this was an experience that Fr. Matt needed to have. God honors our free will and he wants us to choose him freely. When he went, over the course of the week, his hardened heart was softened. In MEdjugorje, you are inserted into an atmosphere of prayer .If nothing else, the place is marked by the sacraments and an expectant faith that God is going to do something. You start to experience the love of God through Our Lady. By the end of the week, he was on his knees praying the rosary. But it wasn’t until 1994 when he went back at 20 years old and God flipped his world upside down through the experience of confession and he got a sense of his vocation. During that confession, it hits him that God loves him uniquely and personally. And that all his sins have affected this God who desires nothing but good for him. Fr. Matt started weeping. Through that, he said to the priest that he didn’t know what to do with his life. He said he thought he might have a calling (despite having a girlfriend of two years). From that point forward he started a journey and three years later he entered the seminary. He been back to Medjugorje three times as a priest. Scot has stories of spiritual and physical healing at Medjugorje for people who have traveled there with an expectant faith. Fr. Matt said while he was at seminary he knew at least three or four other men who were there because of an experience at Medjugorje. 2nd segment: Scot and Fr. Matt welcomed Artie Boyle to the show. Artie works in the Boston Catholic Development Services, helping with the Campaign for Catholic Schools. He started working for the Archdiocese in December 2009. Scot said working in development was a phenomenal experience for him, especially meeting people throughout the Archdiocese. Artie said he has seen many people who have been alienated by events over the past 10 or 50 years are starting to come back and desire to help build up the Church and the faith. Artie and his wife were married at a young age in 1974. He and his wife Judy left school and they didn’t have a job to fall back on so they were in God’s hands. Artie said he was a convenient Catholic at the time, going to church on Sundays and trying to raise the children in the faith. That was pretty much the only sacrament he participated in. He went to Mass an obligation and not really knowing what was going on. He didn’t know until he went to Medjugorje at 44 years old. When you know, it changes your whole outlook and it makes him excited about the Mass and the Word of God. He and his wife have 13 children. Their second child, Artie, was autistic and it was very difficult for 19-year-old. They didn’t believe people who told them they couldn’t have more kids. Their eight child, Joseph Anthony, died of Sudden Infant Death Syndrome. It was the most traumatic thing to happen to them and still is. Their next child was Julianne and since all the other 7 children had been present when Joseph died, Judy decided that they should be present in the delivery room when she had the next child. All the kids were silent the minute the hard labor hit. Two of the children are married. One has eight children and the other has seven. The kids have all done well. Artie is a Special Olympics gold medal winner, another is a doctor, his son Brian plays in the NHL, Brendan has an MBA, and they’re all doing well. They’re very proud and it’s all a gift from God. He said Judy is the key because she is powerful in her faith. The men in the family are the leaders of the home and the women are the heart. He’s convinced that if he doesn’t lead in prayer, it will all fall apart. Scot said research shows that when a father is active in passing on the faith, both boys and girls are much more likely to be active in their faith as adults. Artie said Our Lady has asked men to pray the rosary with the family for a reason, to bring the family together and bring peace to the faith. He can discuss things with his kids after prayer that he wouldn’t be able to otherwise. Fr. Matt said when the family prays together, you might think everyone would react this it’s taking away from recreational time. The irony is that the sacrifice creates a recreation among the family that most parents would give their right arm to have. His experience is that when his family would gather for prayer, they would have the best conversations. This was the family bonding time. Artie said their prayer time is not just rote prayer of the rosary, but it’s also conversation. Family conversation is prayer time. Their prayer time has evolved into a fire pit time. They have a fire pit in the backyard and every Sunday night, everyone from the oldest to the youngest want to gather around the fire pit and talk. It’s not mindless recreation; they love to sit around and talk with their parents. That evolved from the prayer time. 3rd segment: Scot said in the late 90’s was when Artie first was told he had cancer. Artie said he’s always been very active and has been an avid golfer, but at the time he couldn’t play four holes of golf without having to stop. He would feel a burning inside that was so intense he had to stop. The doctors found he was anemic, which is very unusual for a man. He had more tests and they found he had Barrett’s sophagus. He was put on medication and told to come back in a month. A month later he’d lost 45 pounds and his face looked gray and sunken. The doctor said the medicine hadn’t taken effect yet and sent him to stay on it for another month. Had he done that he wouldn’t be here today. Instead, Judy called Mass. General Hospital and they said they could see Artie in a month. So she started to pray. She sat down at the kitchen table to pray and the doorbell rang. A good friend who lives a couple hundred miles away happened to be in the neighborhood. His sister worked at the Mass. General; he made a call and they had an appointment for two days later. The doctors gave him a battery of tests and found nothing. They sent him to a hematologist who did a bunch of tests and found nothing. They scheduled a CT scan at an offsite facility. The technicians told him all he had to do was lie down on the table and hold his breath, but then they said he hadn’t been holding his breath properly and they’d need to take more tests. They said the results would be results would be read the next day so they headed home. Something pulled him to his doctor’s office and as he arrived the doctor’s secretary called and said the doctor needed to see him. When he went in, the doctor was waiting for him, sat him down, and told him he had renal cell carcinoma, cancer of the kidney. It’s the most intense thing he’s ever been told. He immediately began to wonder how much time he had left, who would take care of his 13 kids, how is his wife going to do this by herself, who will teach the boys how to play catch, who will be there for the girls when the boys come around for the prom and all that sort of stuff. The doctor tried to prescribe a tranquilizer right then and there, but Artie said No. He was scheduled for an oncologist immediately and he went right to his office. He sat there for several hours with his head in his hands, but when he started to look around the room he saw that there were people worse off than him. He believed he could beat the cancer, but not once did he think of God. The doctor finally called him in and brought up the CT pictures of the tumor as big as his fist sitting on his kidney. The spleen and the lymph nodes were also infected. The next morning he went with Judy to see the urologist. The surgeon explained that it would an ugly surgery and gave them the details of how bad it would. Judy was silent the whole time and later he learned that Judy was praying and rebuking everything that the doctor was saying. Surgery was schedule for Dec 9, 1999. In the 21 days before, many things happened to them. James 5:14-16 says, “Is anyone among you sick? He should summon the presbyters of the church, and they should pray over him and anoint (him) with oil in the name of the Lord,and the prayer of faith will save the sick person, and the Lord will raise him up. If he has committed any sins, he will be forgiven.” They took it literally and went to every priest they could find, every healing Mass there was. Judy and her sister put his name on the Novena to St. Anthony and put them in the backs of many of the churches on the South Shore. December 8 is the feast of the Immaculate Conception and there was an all-night prayer vigil into the day of his surgery. One of the most profound healing Masses happened after work one day with Fr. Ed McDonough at the Mission Church in Boston. Judy picked him up in the car and he heard a fascinating story about St. Faustina and the chaplet of Divine Mercy. When he got to the Mission Church, he prayed with his whole heart for the first time in his life. As he was praying, he felt something physically strike him in the chest. It knocked him backwards. After that, Fr. McDonough prayed over him and the gray cancer color of his skin disappeared right before everyone’s eyes. The next day, he had his blood tested and he was back to normal, which was a scientific impossibility. Then his wife received a call from a stranger who said they’d been praying to the novena for Artie and who also said they’d lost a relic several months before and found it recently. It was a relic of St. Faustina and they wanted Artie to have it. Meanwhile, as they had been driving to Mission Church, Judy had told Artie that she thought he should wear a Miraculous Medal. Artie had never worn jewelry, never mind religious jewelry. But when they got back to his car that he’d left at work, they found Miraculous Medal on a man’s chain on the passenger seat, even though Artie knows his car door had been locked. Today this day they share the medal with people in need. Artie realized that God was trying to get through to him. Faith was clearly the key ingredient in his healing. There are many people of faith out there and Artie believes in the power of prayer. It was a tough surgery for Artie because it was a new anesthesiologist and he woke up at the end without proper pain medication and writhing in pain. However, the good news was that the pancreatic surgeon wasn’t needed. A membrane had grown between the tumor and the pancreas, protecting the pancreas. So now the pancreas sits where the kidney was. The pathology report two or three weeks later from the doctor said they had got it all and he would live a normal life. Artie’s reaction was to thank Jesus and ask Him what Artie could do in thanksgiving. He didn’t hear anything, so he didn’t do anything and went right back into the rat race. He went back three months later and there was nothing, but eight months later they found three tumors in his right lung. The cancer had metastasized and metastatic renal cell cancer has no cure. No chemotherapy, no radiation, and nothing works but extraction. They went to a thoracic surgeon, along with their medical school student daughter and her medical school student husband. Artie was petrified of going back into surgery and depression and anxiety set in. He was told he had a 5% chance of survival, but surgery was his only hope. This week’s prize is Rediscover Catholicism: A Spiritual Guide to Living with Passion & Purpose by Matthew Kelly. This week’s winner is Katherine Knapp from Sherborn, MA. Congratulations Katherine! 5th segment: The surgery was scheduled for September 14, 2000, which happens to be the feast of the triumph of the Cross. It also was his brother-in-law Kevin’s birthday. Artie and Judy talked to Kevin and his wife, Rita, who is Judy’s sister. The next day Kevin played golf with another good friend of theirs, Robby. Kevin told him the story of Artie’s illness and Robby spent the 18 holes telling him the story of Medjugorje. Kevin told Artie about Medjugorje and Artie said his daughter had given Judy the book,”Medjugorje: The Message” about ten years earlier, and eve though Judy had tried to read the messages of Our Lady at Medjugorje to him, it was inevitably while Artie was watching sports and it went in one ear and out the other. Within one week, Kevin, Robby, and Artie were on their way to Medjugorje in a little village in Bosnia-Hercegovina to be there September 4-10. Artie kept a journal and was inspired to write in that he was going to Medjugorje to see the Blessed Mother and be healed and although he wasn’t necessarily going to see her, he knew that he would be touched by her in some way. Faith is the confident assurance of things hoped for, and the evidence of things yet unseen. He had written that confident assurance and he would receive the evidence. As Artie was flying across the Atlantic, Judy had taken their 5-year-old son, Nick, to a nondemoninational Bible study. Nick went in with the other kids and when they came out, she asked Nick what he learned. Nick said, “Luke 5:13, Be not afraid, your prayer has been heard.” Later in the week, they heard Luke 1:37, “Nothing is impossible with God.” Two things Judy needed to hear while her husband was halfway across the world. She believed from that moment that Artie would be healed. They arrived in Medjugorje and felt that it was a place of supernatural village. It was a tiny village and they’d even brought suitcases of food and water because they’d had no idea what they would experience. The food and water turned out to be fine. They stayed in a family’s home. They went to the church and the first they did was go to confession, the first time for any of them in 15 years. He kind of just blew thought it as an obligation. Then they went into Mass. At Masses in Medjugorje, they pray the rosary first in many languages. But when they sing between the decades, they sing with such conviction that your soul is lifted into heaven. They met their guide after Mass who was supposed to take them to Viska, one of the six visionaries of Medjugorje, whose usual task is to pray over the sick. Unfortunately, the guide told them that Viska had to go to Rome to visit a sick friend and she wouldn’t be able to pray with him. It was disappointing, but they were in Medjugorje. After Mass, the next day he was still anxious, but felt so much peace. They went to buy something nice for their wives at a little jewelry store. He had bought 5 rosary bead bracelets for his daughters and was looking at 5 gold chains and crosses for his sons and though they were expensive, he realized that if he could spend the money he did on golf and hockey and other recreational activity for himself, he could spend it on Jesus. As the thought entered his head, there was commotion immediately to his left and Viska was suddenly standing next to him. She had missed her plane the night before and she had happened to stop in the store. The guide excitedly came over to explain who Artie was and she put her hands on him to pray. The heat that came from his body started making the others with him sweat. They left there to climb up Mt. Krizevac or Cross Mountain. In 1933, the villagers built a 33-ton cross on the mountain that overlooks the entire valley. The mountain is so craggy and the brush so thick that it’s almost impossible to ascend, but the villagers were able to build this cross. Artie and the guys wanted to go up there to pray. They passed St. James Church on the way and they felt called to return to make a better confession. To this day, the priest in that confessional, an English priest who now serves in the missions in Peru, remains a dear friend. In the confessional, the priest explained to him that the Eucharist is the most powerful medicine we have on earth, to take Jesus into his body as often as possible, and ask Jesus to heal him. He told Artie that when he returns home, to live his life as a witness. Leaving the confessional, he realized that his anxiety and depression were gone and that he had gone to Medjugorje not for a physical healing but a spiritual healing. Scot said Jesus often healed people spiritually, before healing physically. Artie said confession is not an option. It is a sacrament that gives us a grace that allows us to walk in the light of Christ. They then went to the mountain. As they climbed, he felt a pain in his lung that he could put a finger on and he said to himself that it was getting worse. It was raining at the time and they’d been told it was too dangerous to climb. At the top of the mountain, they were alone and praying for healing. Artie said he went to Medjugorje in love with the Blessed Mother and afraid of Jesus. Once he was there he fell in love with Jesus and the Blessed Mother took her place. He’s not sure why he was afraid of Jesus, but he knew the Blessed Mother would love him no matter what, just like any mother would. But then he realized that Jesus did love him over there. Scot is struck by the fact that Artie wasn’t alone over there, but was with his friends. They took a picture at the top of the mountain of the three of them standing together overlooking the valley. In the photo, there appears to be an image of Jesus or the Blessed Mother standing behind them with their arms extended. He saw it as a gift for them. They managed to find their way down the rain-slicked mountain and Artie called his wife and asked her to schedule another CT scan before they cut out his lung. She called the doctor and the doctor’s secretary left him a voicemail saying, “We know you’re in Medjugorje, we know why you’re there. The fact is you have cancer and it’s not going to disappear. We’re going to go ahead with the surgery.” So Judy got another doctor. They later found out his parents had gone to Medjugorje and he had a picture from Medjugorje on his office wall. As he left Medjugorje, Artie was convinced he was healed as were Kevin and Robby. The family at home were not yet convinced. 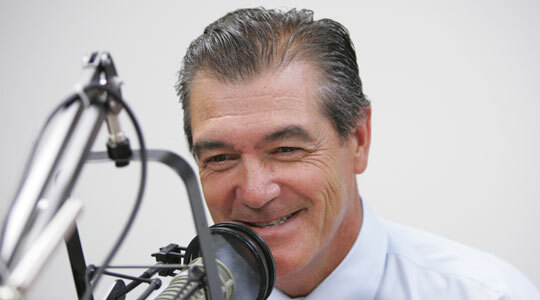 On Thursday, Part 2 of our conversation with Artie Boyle.